Walt Disney's name is synonymous with family entertainment. Mickey Mouse, Snow White and the Seven Dwarfs, Bambi, Disneyland, and numerous other creations have inspired generations of children the world over. From his childhood in rural Missouri to his legendary stature as a film and television icon, Walt governed his life with imagination, ingenuity, and scrupulous attention to detail. Faced with both public failures and massive success, he revolutionized the art form of animation, always seeking innovative solutions, cutting edge technology, and new ways of storytelling. 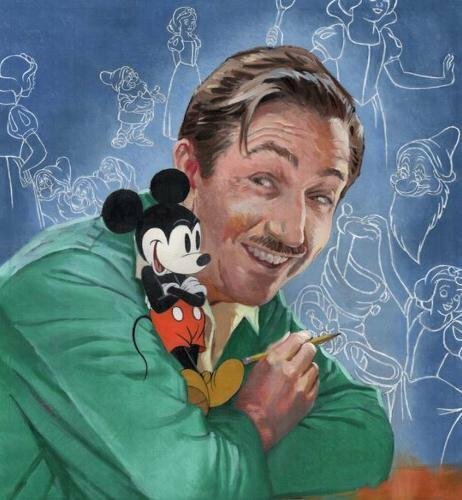 Devoted to perfection, Walt was not always easy to work with, but no one can deny his profound talent and impact. Charting Walt's progression from farm boy to actor to artist, animator, director, and entertainment celebrity, Walt's own words are presented and contextualized within Doreen Rappaport's signature compelling prose. Illustrated with vivid authenticity by animator/painter John Pomeroy, this stunning entry in the award-winning Big Words series reveals a man of deep and varied passions with a constantly evolving vision, and a storyteller above all.